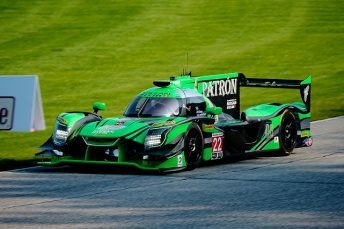 Road America, Elkhart Lake, WI, USA – Nissan power claimed victory at Road America yesterday with Pipo Derani and Johannes van Overbeek taking the No.22 ESM team machine to victory lane in the IMSA WeatherTech SportsCar Championship. Both Nissan-powered Onroak entries finished on the podium with Scott Sharp and Ryan Dalziel finishing the day in third place. The two cars were in contention throughout the day around the picturesque 4.0 mile Road America in the two hour, 40-minute race. Derani made the key move on a restart with 37 minutes remaining when he drafted up behind championship leader Jordan Taylor and then made the pass around the outside into turn one. The move was for second place but with the race leader out of sequence and due to pit, Derani was able to charge to victory – the first for the Nissan-powered Onroak Daytona Prototype International chassis. “To win at Road America is amazing. Hopefully this is just the beginning,” said Derani. “It was really important on the restart because Road America is such a high speed track. Every time we tried to get close to the guy in front we would lose the aero and it is really hard during green flag laps. “I knew that I had to use the restart to try to get really close to him and try a pass. Fortunately I got a good exit out of the last corner and I managed to use the tow all the way down to the first corner. Fuji Speedway, Japan – Nissan had a strong run in the latest round of the Japanese Super GT Championship with Ronnie Quintarelli and Tsugio Matsuda charging onto the podium in second place at Fuji International Speedway. The result was the first podium of the season for the No.23 Motul-backed car and the second race in a row where a Nissan GT-R NISMO GT500 machine has finished second. Former GT Academy winner Jann Mardenborough and Hiro Yasuda also had a strong run at Fuji into fifth place. “In the early stages of the race the balance of the car wasn’t that great but as the race progressed the road surface conditions got better and about 10 laps before pitting it became much easier to drive and I was able to push pretty hard,” Quintarelli said. “Although we probably could have pushed the pit timing out a little bit, I could see the traffic in front of me so I think we made a good decision in the end. Matsuda held off great pressure from third place in the later stages before closing down in on the race leader in the dying moments of the race. “There were a number of times when the back markers appeared at really unfortunate moments but I was able to fend off the No. 38 in those instances,” Matsuda said. Quintarelli and Matsuda are one of only three cars to have finished in the points in every race so far this season and now sit in fifth place in the points – only three points off the lead. The next race in the Super GT Championship – another event live streamed on NISMO.tv – is the Suzuka 1000km on August 26. Utah Motorsports Campus, Salt Lake City, UT, USA – Former GT Academy winner Ricardo Sanchez is eagerly awaiting the chance to get back behind the wheel this weekend as the Pirelli World Challenge SprintX Championship heads to the Utah Motorsports Campus in Salt Lake City. Sanchez and Frankie Montecalvo picked up a pair of podium finishes in the Pro/Am class at Lime Rock Park in May for Always Evolving/Aim Autosport and the Mexican ace is looking forward to his Utah debut and hoping to follow in the footsteps of another GT Academy winner. “Nissan won in Utah with Bryan Heitkotter so the car is certainly quick there and the track suits the car,” Sanchez said. “We have to focus on a good setup and a clean race and I think our first win is certainly on the cards. This weekend will be very different for me because I haven’t been able to find the track on the simulator. “This will be the first time I’ve been to a track without being able to practice on the sim so that will be a new challenge but I’ve been studying video and making notes. We do have a lot of track time so there will be plenty of time to prepare once we arrive.